“My book is also the story of hope and forgiveness, and how the suffering each of us endures should not take away our humanity and kindness.” – Joseph Sebarenzi, Ph.D.
God Sleeps in Rwanda is a harrowing tale of survival and reconciliation by a Rwandan Tutsi who flees his homeland before the 1994 genocide and later returns to be elected speaker of the Rwandan parliament, only to be forced into exile once again. This memoir tells the story of Joseph Sebarenzi, whose parents, seven siblings, and countless other family members were among 800,000 Tutsi brutally murdered over the course of ninety days in 1994 by extremist Rwandan Hutu—an efficiency that exceeded even that of the Nazi Holocaust. Outbreaks of ethnic violence had been occurring in Rwanda since colonial times when the Belgians ruled the region. As a child, Sebarenzi twice hid with his mother during episodes of killing, narrowly escaping with his life. When he was a teenager, his father sent him away to school in Congo, telling him, “If we are killed, you will survive.” Sebarenzi returned to Rwanda after the genocide and was elected speaker of parliament. But he then learned of a plot to assassinate him, leading him to once again flee the country in a daring escape. The poetic title of the book is taken from an old saying, “God spends the day elsewhere, but He sleeps in Rwanda,” but this African nation is not alone in having had a shameful history of ethnic violence. God Sleeps in Rwanda demonstrates how horrific events can occur when the rest of the world stands by and does nothing. It also shows us how the lessons of Rwanda can prevent future tragedies from happening in that country and other parts of the world. Readers will be inspired by the eloquence and wisdom of a man who has every reason to be bitter and hateful, but chooses instead to live a life of love, compassion, and forgiveness. After the Holocaust, people of all countries and faiths vowed, “Never again.” Yet in 1994, Hutu extremists in Rwanda slaughtered 800,000 Tutsi and moderate Hutu—one-tenth of the country’s population and three-fourths of its Tutsi people—in 90 days of genocide, using machetes, clubs studded with nails, and small arms. Despite the crudeness of their tools, the efficiency of the killers was unprecedented. It happened in front of our eyes, on television, yet nothing was done. How was it possible? 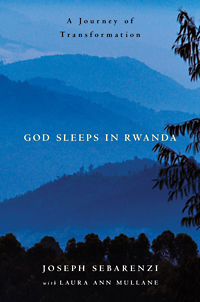 Now, in GOD SLEEPS IN RWANDA: A Journey of Transformation (Atria Books; September 2009; $25.00 U.S./$32.99 Can. ), Joseph Sebarenzi, former Speaker of the Rwandan parliament and a leader who worked alongside the Rwandan president and prime minister and welcomed President Bill Clinton, Secretary of State Madeleine Albright, and U.N. Secretary General Kofi Annan to Rwanda, shares his harrowing, deeply moving tale of survival and reconciliation. Sebarenzi, a Tutsi raised in Rwanda, was profoundly shaken by the violent deaths of his parents and siblings, but returned to his homeland in 1995 after a few months in Canada. As Speaker, he hoped to help secure a new democracy in which Tutsi and Hutu might regain the strong national identity and peace they had lived in prior to Belgian colonization—less than 50 short years before the 1994 genocide. Five years later, he was running for his life, vilified in public by those who only felt safe supporting him in private, desperate to reach the Ugandan border, pursued by soldiers loyal to the brilliant and ruthless despot who betrayed him. In this insightful and riveting political and personal memoir, written with Laura Mullane, Sebarenzi clearly describes how the tumult in Rwanda came to be, and why he still feels there is hope. He tells how he first learned as a boy that close family friends would kill him because he was Tutsi; how fierce bloodshed would immediately end when drums beat the message ihumure…”It is time for peace” over the hills, and how the country’s young parliament enacted bills to establish a balanced leadership among the president, legislature, and judiciary—a promising foundation undone in three months by Paul Kagame, military leader of the Rwandan Patriotic Front. Reading GOD SLEEPS IN RWANDA, we understand the forces behind the horror, why it unfolded as it did, and why Sebarenzi returned more than once from safety in other countries to try to restore the nation he loves. It is a reminder of the power of one person to make a significant difference against deadly odds, and an eloquent plea for action wherever human rights are trampled, whether by genocide in Darfur, state-sanctioned political repression in Iran, Taliban actions in Afghanistan and Pakistan, or oppression of women in certain parts of the world.